The EOS M was heavily criticized when released for terribly slow autofocus. A firmware update (to version 2.0.2) later and the the EOS-M is certainly improved but it’s still no fast action shooter. It will probably always be known as somewhat of a flop but I wouldn’t discount the capability of the EOS-M straight away. As it turns out, as I tested it, it’s actually pretty good. I shoot most of my astrophotography with a Canon EOS 6D and Rokinon Lenses. The 6D has excellent signal-to-noise ratio and low grain at high ISO performance and the Rokinon 24mm/1.4 and 14mm/2.8 have excellent sharpness wide open. But sometimes, a DSLR and a big wide lens is just too much camera to bring. I often prefer a trip where my equipment is not a burden and as a result I’m always looking for a way to reduce my pack weight. When searching for a more compact camera, the EOS-M wasn’t exactly the first camera on my list. After excellent experiences with the Fuji X-E1, I was much more excited about Fuji’s newest X-M1 or Sony’s NEX series of mirrorless cameras, I was even looking at Sony’s excellently reviewed RX100 II. Honestly, if it weren’t for the the latest price-drop, I probably wouldn’t have considered purchasing the EOS-M. 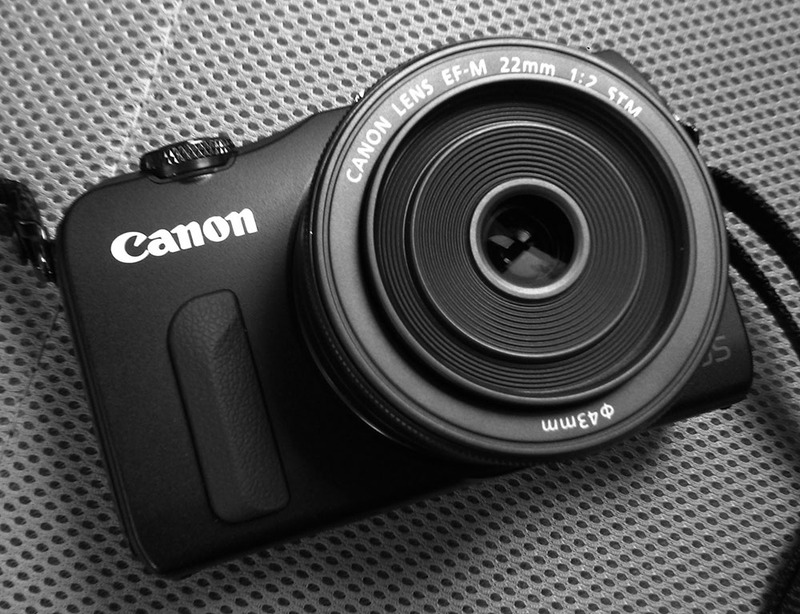 But let me just say it: at less than $400, the EOS-M is an absolute steal. With the firmware update, I have found the autofocus to be just fine. Besides, if you’re shooting action sports with a compact mirrorless camera, you should stop now. These small cameras are not built for fast action; their ergonomics are not friendly for fast movement. If lightning autofocus is what you want, get a DSLR. 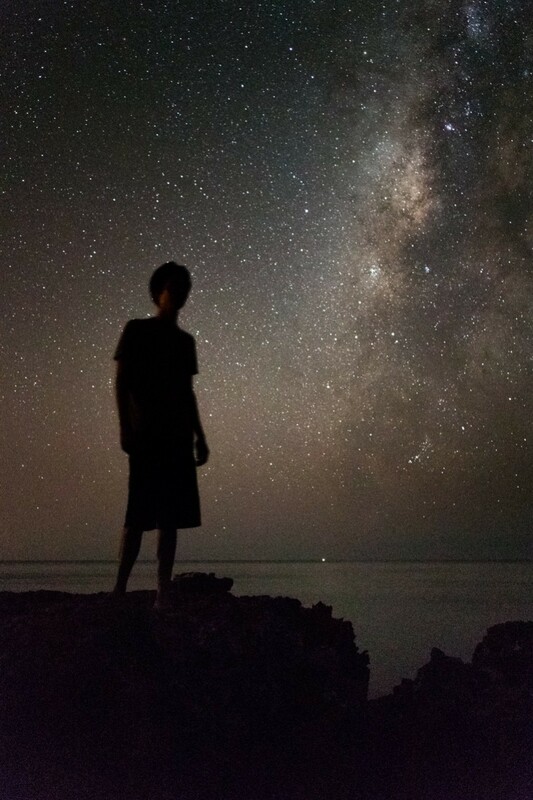 The intention for this blog is to make astrophotography as accessible as possible to everyone. As such, a camera this capable for such a low price strikes a certain chord with me. It has all the things you need to make a great astrophoto at a price that’s much more reasonable than the typical DSLR setup. 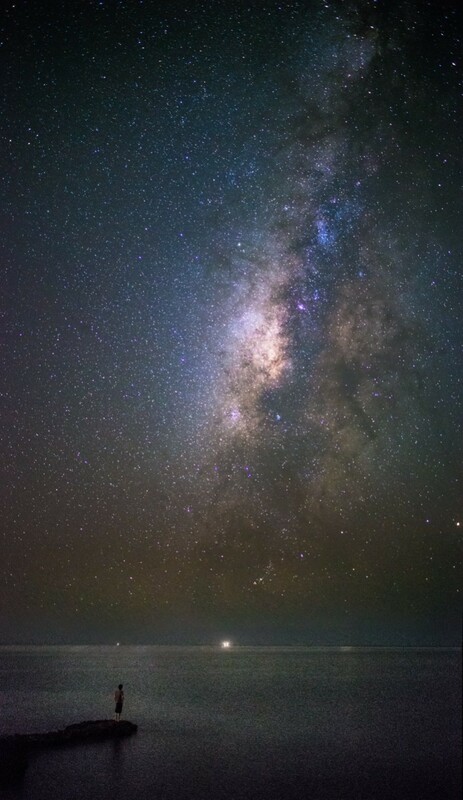 I have made it a point to test and review the Canon EOS-M specifically for Milky Way Astrophotography and the results are downright amazing for a camera/lens combination that costs less than a single DSLR lens. What you get for your money is an efficient sensor with excellent low noise capability and an amazingly sharp and fast lens with the 22mm kit. The EF-M 22mm f/2.0 STM is almost reason alone to get the camera. It’s very fast and adequately wide for astrophotography. These features are all in a very small body, nearly the size of a point and shoot. I approached the Canon EOS-M with skepticism and a ton of prejudice, especially when one of my primary cameras is the Fujifilm X-E1, a retro styled mirrorless that has won my heart over every time it comes out of the camera bag. There’s something so utterly satisfying about the fact that I can dial in my aperture and shutter speed with a physical, clicky knurled aluminum dial on the X-E1. With my heart already taken by my Fujifilm, I expected very little from the EOS-M. I started out hating that there was no optical viewfinder, no electronic viewfinder, nearly all touchscreen controls and no mode dials. By comparison to the X-E1, the EOS-M is completely alien, the polar opposite in design intent. Surprisingly, after a day or so of familiarizing, I started liking loving the touchscreen controls and ergonomics of the EOS-M. I’ve actually found that settings can be changed with great ease and doing things like checking focus or setting a different focus point are lightning fast on the touchscreen interface. Even Manual Focus is excellent and I have had no problems getting tack sharp focus on the stars. From a hand holding point of view it’s comfortable enough for snapshots and the rubberized strip on the front makes for a fine grip. Compared to similar size point and shoots, the large sensor on the EOS-M allows it to use comparatively large lenses which translates to extremely good low-light performance for such a small camera. It’s ISO performance at ISO 6400 is quite good, especially with the built-in long exposure noise reduction if you’re doing astrophotography. It’s not as good as a full-frame sensor camera like the Canon EOS 6D or Nikon D800, but for the price and the weight, it pushes out some unbelievably clean results. One of the great benefits of this camera is the EF-M 22mm f/2.0 STM lens. It’s a really really small lens but the images it produces are excellent, especially for wide-field astrophotography. It exhibits very little coma or spherical aberration wide-open and is plenty fast for night and astrophotography shooting. Even with all I’ve learned to love about the EOS-M, it isn’t without its problems. Autofocus actually isn’t one of them. The largest problem for me is the omission of an intervalometer or remote trigger jack. This makes it basically impossible to create time lapse sequences with the EOS-M, which is a damn shame. Time lapse and landscape astrophotography usually go hand in hand because the exposures are relatively long and it’s often beneficial to stack multiple consecutive exposures to boost signal-to-noise ratios in the image. Unfortunately, the EOS-M has no support for tethered shooting and no hardware input for an intervalometer. This is a common omission on mirrorless camera, the entire Sony NEX line also lacks a way to plug in a hard-wired remote or intervalometer. There are a couple workarounds, however. Cameras like the EOS-M and the Sony NEX still have a sensor built in, allowing you to trigger the camera with the use of an accessory infrared remote. For time lapse on these cameras, there are actually a few vendors selling intervalometers that use an infrared LED to trigger the camera to make time lapses. There’s the Gentles Limited gentLED Auto and the Tempus Time-Lapse Remote, both of which are compatible for a wide range of camera makes and models. In my opinion, neither is a very elegant solution, but they are a suitable workaround to achieve time lapse on cameras without a hardwired remote jack. Tempus even has a mechanical model that physically presses the camera shutter button for cameras without any method of remote triggering. There’s also one last possible remedy for the EOS-M intervalometer and that’s Magic Lantern, a custom firmware that loads from your camera’s SD card. As of this writing there’s an early Alpha release of Magic Lantern that has allowed users to successfully use a software intervalometer to create time lapses with the EOS-M. Right now, the Magic Lantern release is a little buggy but still provides the added functionality of an intervalometer. I’ve used it personally with excellent success. (Sept. 25, 2013 Nightly Build for reference). Why camera manufacturers don’t include a software intervalometer on ALL of their cameras, I do not know, it’s a very simple feature that requires absolutely no extra hardware. Maybe that’s easier to say as the 1% of camera users that actually make time lapses. Maybe it will be standard in all cameras someday, fingers crossed. If the Magic Lantern firmware for the EOS-M is refined to a stable release, it would add a tremendous amount of value to what I believe is already a relatively undervalued camera. If you’re interested in seeing more Milky Way photos made with the EOS-M, check out my most recent Kaena Point blog post. In conclusion, I wouldn’t eliminate the EOS-M as a contender if you are looking to purchase a compact interchangeable lens camera. Other cameras I would consider alongside it are the Sony NEX Series and the Fuji X Series. The EOS-M produces fine results and performs excellently as far as I have experienced. In the realm of astrophotography, I would expect similar results from other recent generation APS-C sensor cameras, the EOS-M with the 22mm lens just happens to be a particularly affordable and brilliantly compact astrophoto solution. which f stop (2.0?) and how long for shutter speed ? Have you ever use iso 3200 on EOS M? Hello! I recently discovered your website and I believe have read every bit of content on it now. 🙂 You’ve helped me a ton with my beginner search and foray into astrophotography. I’ve found some deals right as I was about to the purchase the EOS M and 22mm for $250 here in the US. Mainly, the Rebel T5 with a $400 printer included for $399 after mail-in rebate. Am I correct in still thinking the EOS M would serve me better for night astro/landscape photography versus the Rebel T5? I’d love a smoking deal on a quality printer in case I ever take anything I particularly like, plus I do use an old Canon printer I have a couple times a week, so it wouldn’t sit unused. But I’m buying a camera for what I need first – I do already have a functional printer and access to professional shops if I ever need glossy/pro prints. In either case I am also purchasing the Rokinon 8mm fisheye. Thank you so much for any advice you can give me on this. I like the cameras in this price range, especially that $250 EOSM/22mm, just wanted to verify it was still better than the Rebel T5. I will be using Magic Lantern as well, particularly with the EOSM. Oops, and the T5 comes with the EF-S 18-55mm f/3.5-5.6 IS II Lens. Both cameras are very very similar in terms of the photos they can make as they share the same sensor. I wouldn’t regard one as better than another, just different. I personally think the EOS M and 22mm lens is a steal at $250, especially when paired with Magic Lantern. Just given its low price, I would probably start with the EOS M.
EOS M arrives today, I’ll be experimenting tonight if these clouds clear! Followed you on Twitter too by the way!